Determining what cross country ski bindings you need can depend on your boot, ski / type of skiing, and terrain. Since there are many variables and options out there, it can be pretty overwhelming. Fortunately, I'm here to give you an overview of the bindings available as well as how to select the correct one. If you have any questions, please let us know! Backcountry Skis are wider and shorter than traditional nordic skis, and typically have a full metal edge and fishscales. They are used on hilly, mountainous terrain. The wider cut and metal edge give the skier more control descending slopes, and thus they make it easier to carve turns. In order to properly turn, the bindings must fit the skis. If the ski is wider than 63mm at the midpoint, we recommend a 3-pin binding. If the ski is narrower than 60mm at the midpoint, we recommend the NNN BC binding. 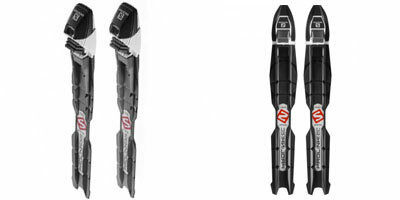 The three pin binding offers better control by providing three points of contact between the ski and the boot, but is a larger, heavier, and typically more expensive binding. The NNN BC binding is lighter, but still provides more control than the touring NNN Binding. 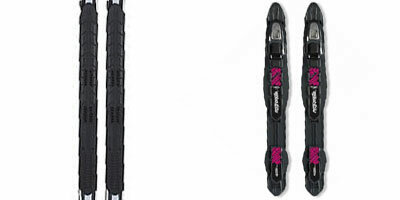 If the ski is in the middle widthwise, you can select whichever binding best fits the terrain on which you ski. There are separate three pin and NNN BC boots that correspond to the bindings. Left to Right: NNN and SNS Touring Ski Bindings Touring Skis are typically shorter than traditional nordic skis, but narrower than backcountry skis. They are typically used on ungroomed terrain in parks, golf courses, and bike trails, as well as groomed touring centers. Most have a waxless fishscale pattern, and some have a metal edge. 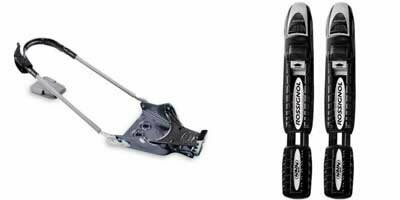 The two main types of touring bindings are NNN (New Nordic Norm) and SNS (Salomon Nordic System). Both binding systems work well, and a customer chooses their binding based on which boots they have. All touring companies (including Salomon) make boots that fit the NNN System, whereas only Salomon makes boots in the SNS system. Left to Right: Skate and Classic Race Binding Bumpers Race / Performance skis are narrower, longer, and lighter than touring and backcountry skis, designed to perform well on groomed trails. The skate ski bases are waxed with a solid, iron in wax, and the classic skis are either waxed with a sticky kick wax, or come with mohair skins built into the kick zone. The bindings for these skis are very similar, and usually there is a classic and skate version of the same binding. Typically the only difference between the skate and classic versions of the bindings is the bumper. Classic bindings have a softer bumper to allow the boot to flex forward when skiing, whereas the skate bumpers are stiffer to keep the ski locked in position. DO YOU HAVE NNN OR SNS BINDINGS? 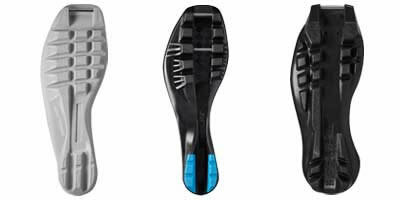 Left to Right: NNN, SNS / Pilot, Older SNS / Profil Boot If you have a pair of boots and you aren't sure which binding system you have, take a look at the sole. If there are two thin, shallow grooves running the length of the sole, then it is an NNN boot. Salomon's NNN boots are called Prolink. If there are two bars, it is a current SNS, or Pilot boot. If it has one bar, look at the center of the boot -if there is a wide, deep, groove running the length of the sole, it is an old SNS, or Profil Boot. DO YOUR SKIS HAVE A PLATE? Many of the more recent skis come with a plate on which you can install a slide on binding. These bindings are easy to take on and off, and most can be adjusted to move back and forward on the ski. 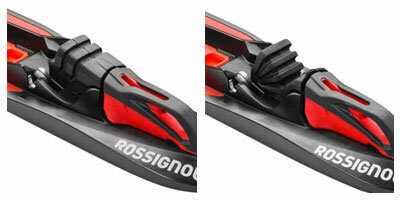 If the ski has an NIS plate (a single black plate), you can install a Rottefella Touring Automatic Binding. If the ski has an IFP plate (two black plates with a colored plastic piece with three holes on the top plate) then you can install a Turnamic Binding. Both of these plates are only compatible with NNN bindings. SNS bindings can be drilled through a plate, but they require an adaptor plate for IFP bindings. DO YOU HAVE MANUAL OR AUTOMATIC BINDINGS? Prolink Access Manual Bindings Drill in Bindings often come in manual or automatic. An automatic binding is a step in binding; to release, you must press your pole onto a button on the binding. A manual binding must be opened by hand (usually by lifting a lever); once you step in, you need to close it manually. The binding releases the same way. If your ski doesn't have a plate, you will need a drill in binding. 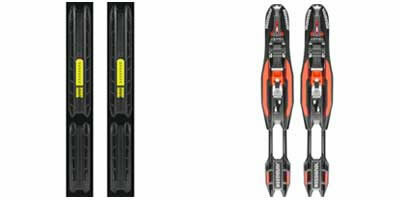 For NNN bindings, select a Salomon Prolink binding, either the Prolink Auto (automatic) or Prolink Access (manual). 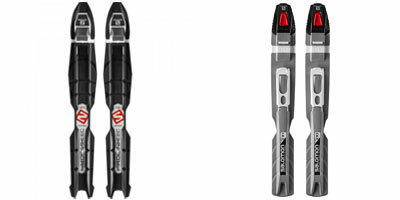 For Pilot Boots, you can either use the Salomon Profil Auto Universal Binding (automatic), or the Salomon Pilot Sport Classic Binding (manual). For Profil boots, select the Salomon Profil Auto Universal Binding (automatic).